Using the Hubble Space Telescope astronomers have discovered the most distant galaxy that acts as a gravitational lens, breaking the previous record-holder by 200 million years. Astronomers using NASA’s Hubble Space Telescope have unexpectedly discovered the most distant galaxy that acts as a cosmic magnifying glass. Seen here as it looked 9.6 billion years ago, this monster elliptical galaxy breaks the previous record-holder by 200 million years. These “lensing” galaxies are so massive that their gravity bends, magnifies, and distorts light from objects behind it, a phenomenon called gravitational lensing. Finding one in such a small area of the sky is so rare that you would normally have to survey a region hundreds of times larger to find just one. The object behind the cosmic lens is a tiny spiral galaxy undergoing a rapid burst of star formation. Its light has taken 10.7 billion years to arrive here and seeing this chance alignment at such a great distance from Earth is a rare find. Locating more of these distant lensing galaxies will offer insight into how young galaxies in the early universe build themselves up into the massive dark-matter-dominated galaxies of today. Dark matter cannot be seen, but it accounts for the bulk of the universe’s matter. 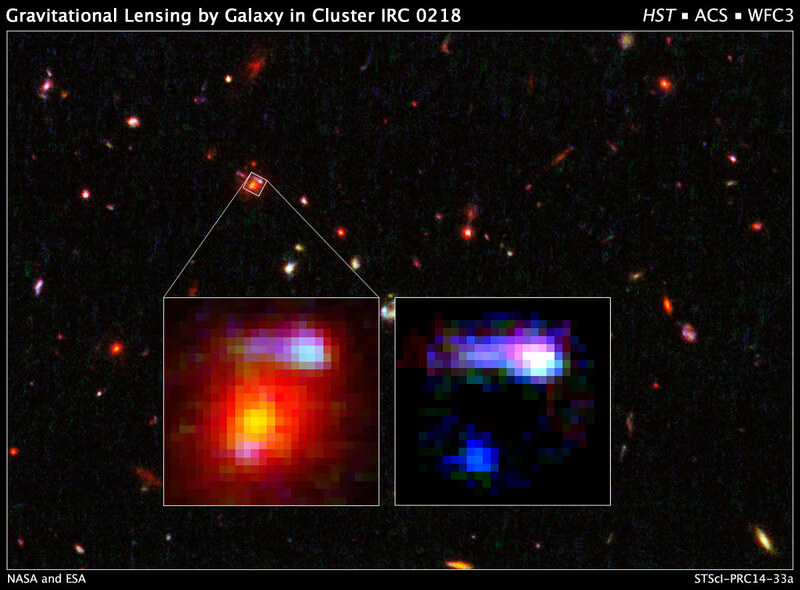 Team members Kenneth Wong and Sherry Suyu of Academia Sinica Institute of Astronomy & Astrophysics (ASIAA) in Taipei, Taiwan, used the gravitational lensing from the chance alignment to measure the giant galaxy’s total mass, including the amount of dark matter, by gauging the intensity of its lensing effects on the background galaxy’s light. The giant foreground galaxy weighs 180 billion times more than our sun and is a massive galaxy for its time. It is also one of the brightest members of a distant cluster of galaxies, called IRC 0218. The team suspects the lensing galaxy continued to grow over the past 9 billion years, gaining stars and dark matter by cannibalizing neighboring galaxies. Tran explained that recent studies suggest these massive galaxies gain more dark matter than stars as they continue to grow. Astronomers had assumed dark matter and normal matter build up equally in a galaxy over time, but now know the ratio of dark matter to normal matter changes with time. The newly discovered distant lensing galaxy will eventually become much more massive than the Milky Way and will have more dark matter, too. Tran and her team were studying star formation in two distant galaxy clusters, including IRC 0218, when they stumbled upon the gravitational lens. While analyzing spectrographic data from the W.M. Keck Observatory in Hawaii, Tran spotted a strong detection of hot hydrogen gas that appeared to arise from a giant elliptical galaxy. The detection was surprising because hot hydrogen gas is a clear signature of star birth. Previous observations showed that the giant elliptical, residing in the galaxy cluster IRC 0218, was an old, sedate galaxy that had stopped making stars a long time ago. Another puzzling discovery was that the young stars were at a much farther distance than the elliptical galaxy. Tran was very surprised, worried and thought her team made a major mistake with their observations. The astronomer soon realized she hadn’t made a mistake when she looked at the Hubble images taken in blue wavelengths, which revealed the glow of fledgling stars. The images, taken by Hubble’s Advanced Camera for Surveys and the Wide Field Camera 3, revealed a blue, eyebrow-shaped object next to a smeared blue dot around the massive elliptical. Tran recognized the unusual features as the distorted, magnified images of a more distant galaxy behind the elliptical galaxy, the signature of a gravitational lens. To confirm her gravitational-lens hypothesis, Tran’s team analyzed Hubble archival data from two observing programs, the 3D-HST survey, a near-infrared spectroscopic survey taken with the Wide Field Camera 3, and the Cosmic Assembly Near-infrared Deep Extragalactic Legacy Survey, a large Hubble deep-sky program. The data turned up another fingerprint of hot gas connected to the more distant galaxy. The distant galaxy is too small and far away for Hubble to determine its structure. So, team members analyzed the distribution of light in the object to infer its spiral shape. In addition, spiral galaxies are more plentiful during those early times. The Hubble images also revealed at least one bright compact region near the center. The team suspects the bright region is due to a flurry of star formation and is most likely composed of hot hydrogen gas heated by massive young stars. As Tran continues her star-formation study in galaxy clusters, she will be hunting for more signatures of gravitational lensing. The team’s results appeared in the July 10 issue of The Astrophysical Journal Letters. 1 Comment on "Hubble Discovers the Farthest Lensing Galaxy to Date"
It’s just fantastic to be able to read about these amazing discoveries and fascinating hypotheses, all so interestingly written up, thankfully, in reasonably layman-like terms for a simpleton like me to ponder over. Keep up the good work! !